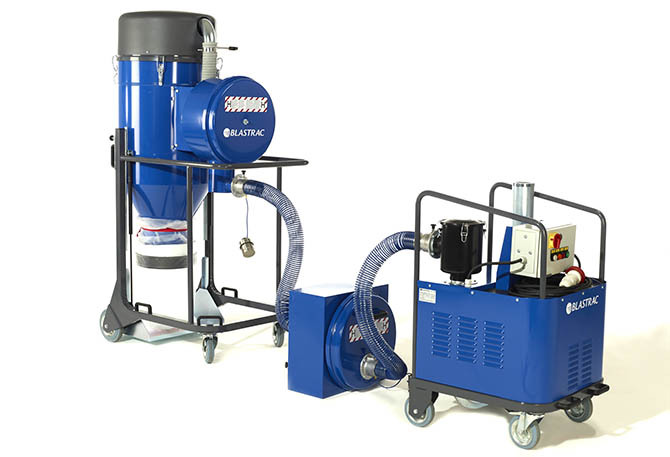 The Blastrac BDC-3160H SPLIT is a heavy duty dust collection system ideal for all types of applications and specially to deal with hazardous materials. It is composed of 3 units: the filter unit and the safety filter unit box, both equipped with HEPA filters, and the suction unit. The engine (suction unit) is outside the contaminated area in order to keep it clean (no need to clean it after work, saving time and money). The safety filter unit box is used to make the connection between the contaminated and the safe areas while the filtering unit is inside the contaminated zone. The industrial dust collector can be installed on the ground floor while one BGS-250 and one BHG-1800 are working on the 6th floor. The BDC-3160H SPLIT is equipped with a Longopack bagging system, which is easy to mount and handle. Thanks to this system, the operators have no more contact with the dust in their direct vicinity which is better for environment and the operators health. It is designed for uninterrupted operation on the toughest jobs.